The Edge range of 4-way coaxial speakers combine stunning design and performance in an end product which sets a new edge against the competition. The unique electroplated IMPP cone has been formulated to offer increased bass response whilst the PEI midrange and tweeter units offer crystal clear highs. The range of size options available ensure that Edge coaxial speakers are a direct fit for almost every vehicle on the market today. 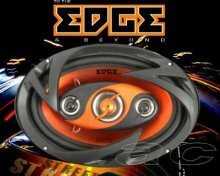 Speaker Size: 6x9 (150mm x 220mm). Also Available In Our Store.